SAN FRANCISCO, Dec. 19, 2018 /PRNewswire/ -- Skycatch today announced its Skycatch High Precision Package (HPP) has been selected by Teck Resources Limited ("Teck"), Canada's largest diversified resource company, for aerial drone surveying at a number of its mining operations. "Customers like Teck are setting new standards in the mining industry by implementing tools that support their mission of increased safety and efficiency. We couldn't be more proud to assist Teck by helping them reach their admirable goals with the Skycatch solution," says Christian Sanz, Founder & CEO of Skycatch. By using a solution that is specifically tailored for the Enterprise client, Teck is using a cost-effective and safe approach to surveying with a wide range of benefits including sub-5-centimeter georeferenced topographic maps and the ability to perform on the fly volume calculations while sharing data efficiently. 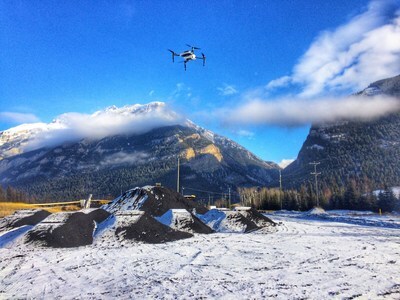 "Using drone technology at our operations is just one of the ways Teck is putting innovation and technology to work across our company to improve productivity and enhance safety and environmental performance," said Laura Ingram, Senior Engineering Supervisor, Teck Line Creek Operations. Teck uses Skycatch at its Red Dog Operations in northwest Alaska and at its Line Creek steelmaking coal operation in the Elk Valley of British Columbia, Canada. Both of these sites can experience high winds and drastic temperature changes, which require a ruggedized UAV that can stabilize itself and withstand even the most demanding conditions. The HPP provides the full solution to rapidly collect and process their data capture with a crisp and precise output to view the progression of the site in near real-time. This has helped Teck improve communication, safety, and efficiency.